Award winning pet photographer, based in Staffordshire. With a keen interest in local history, rambling, a love of The Peak District and all animals. Ranton is a quiet little hamlet in Staffordshire, around 3 miles from Stafford and it is recorded in the Doomsday Book in 1086 under the Pirehill Hundred. One thing about Ranton though is that it has hidden a couple of pretty big pieces of history that most people in Staffordshire probably know nothing about. Ranton Abbey's surviving 14th century tower and the ruins of Abbey House, a large country manor house in a 300 acre estate. Ranton Abbey (also known as Ranton Priory), was built in 1150 by Robert Fitz Noel of Ellenhall. It was an Augustian Abbey and flourished in the 13th century, as a subordinate house to Haughmond Abbey (near Shrewsbury). Life at Ranton was not necessarily the peaceful existence which we might expect though, as there are many recorded problems with discipline and mismanagement, particularly in the 14th century. At the turn of the eighteenth century Llangollen was well-known for being the home of the Ladies of Llangollen : Lady Eleanor Butler and Miss Sarah Ponsonby. The romantic story of their elopement from their families in Ireland, their journey to Wales and their setting up home at Plas Newydd captured the imagination of Regency society. They claimed they were seeking a better way of life, devotion to an ideal but with hindsight we can see Eleanor Butler and Sarah Ponsonby were probably just devoted to each other. This 18th century couple found each other in Ireland where they lived in the comfort and privilege provided by their wealthy families. Over the years they improved their home and created a way of life peculiarly their own.They became more and more reclusive, hiding from strangers. Although the more they did this, the more popular they became. Avid readers, their library improved to become one of the best in the area and their home was fitted in good taste throughout. As it has rained almost none stop for over a week, we thought it might be nice to take the dogs for a walk to Stanley Pool and have a look at how the dam was flowing. As it turns out, it was flowing quite well! This is the dam at the north west end of Stanley Pool. 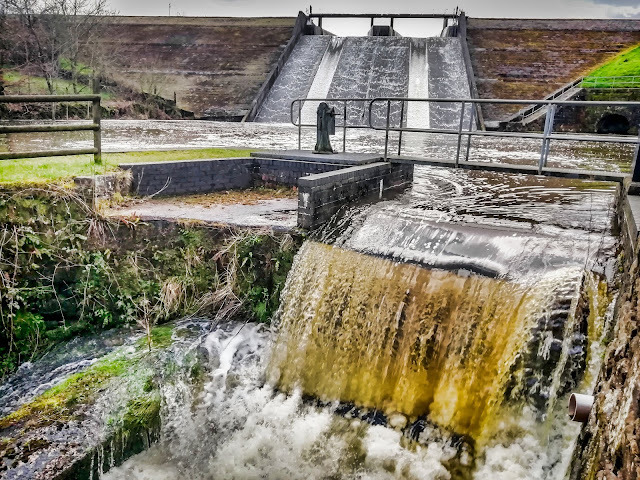 It was built in 1786 as an 8 acre reservoir to supply water for the nearby Cauldon Canal. The pool was enlarged to 33 acres in 1840 with the construction of the dam in the photograph. The pool above was created by damming the stream flowing to the west of the village of Stanley. Today the pool is used for fishing and has a sailing club. It isn't just the dam and the pool that are interesting though, there are some lovely walks around the area too, with lots of wildlife and bird to be seen. The public footpaths are clearly sign posted and are available to view on local OS maps of the area. I would advise going on either a sunny summer day or after a lot of rain, which is when the over flow is most interesting. Hidden deep in the valley of Lathkill Dale in The Peak District is a little known Scheduled Ancient Monument. This is one of the most beautiful valleys in the Derbyshire Dales and is only about 3 miles from Bakewell. You can park at the pay and display car park at Over Haddon and then head down the steep road that decends into the valley. 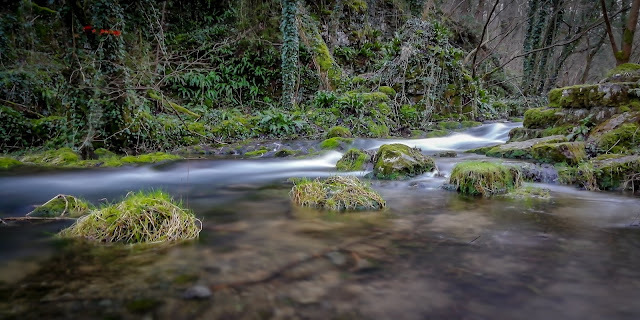 This area is a nature reserve of national significance and contains several rare species of plants including the rare Jacobs Ladder that is found growing in one location, isolated, in Lathkill Dale. As you walk along the beautiful and crystal clear river in the valley, you start to see remnants of an industrial past. The odd bit of rock that doesn't quite look natural, or parts of the river that look man made. It's only when you come to the open mouth of a cave next to you that you realise this is a place of some importance. Love what you see? Buy us a coffee!